Nowadays, people are not so keen on drinking water straight from the tap. They fear that the city or municipal water source is contaminated with chemicals and bacteria. In reality, the water from the water company is actually treated before being distributed to households but still, other people are not convinced, and that is why bottled water is so popular. People believe that the treatment that bottled water goes through is sufficient to keep it free from contaminants and harmful chemicals. Aside from buying bottled water, you also have the option to set up your own purification system at home. You can purchase water filters and attach it into your taps in the kitchen. Filter water taps are often made of activated carbon. These are very popular filter water taps because they can remove many contaminants from the water, such as chlorine, radon, organic solvents, pesticides and herbicides. There are two main types of activated carbon filters. The first is granular activated carbon (GAC). This filter has small particles of carbon in it and the texture is similar to ground coffee or fine black sand. It removes impurities from water by adsorption. The second type is powdered block carbon filter. This type is more preferred and is more expensive than the granular type and it physically blocks water contaminants because it is so dense compared to GAC. The most common variety is the refillable pitcher or jug that comes with activated carbon. This can be placed in the refrigerator to keep the water cool. 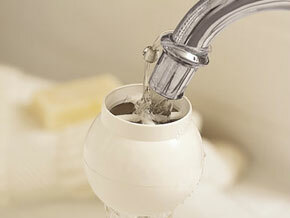 A faucet-mounted filter allows you to filter water straight from the tap. There is a switch so you can turn the filter on and off. This type is limited to one tap per filter so if you wish to filter water from several taps, then you will have to get multiple filters. An under-the-sink filter is similar to the faucet-mounted filter because it serves only one faucet. It is installed underneath the sink and therefore cannot be seen. Filter water taps of this kind last longer than the faucet-mounted types. A whole house system is the most expensive type. This is attached to the home’s main water line and provides filtered water for the entire house. The activated carbon filtration system follows a very simple concept. When charcoal is activated, it becomes highly porous with a large surface area. The surface area can be 300 to 2,000 meters per gram. When the contaminants pass through the carbon surface area, they get attracted to the carbon chemically and as a result, they get trapped there. The surface areas are called bonding sites, and when filled with impurities and contaminants, the filter ceases to work. When this happens, it’s best to replace it with a new one. The size of contaminants that activated carbon filter removes is measured in microns. The higher the micron, the less effective it is. It’s been said that active carbon filter can effectively remove contaminants that are 0.5 micron in size, while it is least effective for contaminants that are 50 microns in size.